The summer just barely started and your kiddos are already bored. They have done everything there is to do, and lost interest, fairly quickly. It is for this reason that parents hate summer. They have to work to make sure their children are staying out of trouble, at least once the kids grow older. When your kids are still young, are require a constant babysitter, parent, or daycare supervision, a plan must be set in place to make sure they can do fun things throughout their summer. Sure, the pool is always a great hang out spot for the kiddos—keeping them cool throughout the hot summer days and allowing them to get some outdoor play time. But kids do lose interest easily, and the pool every day could turn into bore rather than a source of entertainment. So how is a parent or a caretaker supposed to keep a child having a blast all summer long? The first step is to find a nanny that is a child at heart and knows how to create a fun time for your kiddos. You want someone who will pay attention to your children and make sure they have a good time all summer long. If you are still searching for the perfect summer plan for your child, check out Inch By Inch Child Care summer camp calendar! If you have made arrangements for this summer, be sure to sign your kids up next summer! But if you decided to take the summer off to hang out with your kiddos, good luck and hopefully these summer tips can help you survive the summer! This wonderful holiday, celebrating our freedom, is the perfect time to do fun outdoor activities with your little munchkins. This is a great weekend to take your kid camping, teach them how to rough it in the woods and enjoy the feeling of being free from the distractions of society. Obviously, that is a little deep for a kindergartener, but you sure can enjoy the freedom from technology, cars, and other people. Camping is a great way to get your kiddos out of the house, enjoying nature, and maybe even finding a new hobby that could become an annual tradition. 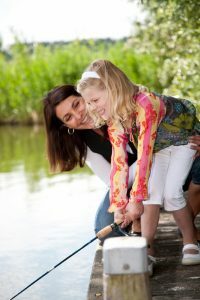 While camping you could teach your kids how to fish, pitch a tent, and if you are feeling extra dangerous you could teach them how to start a fire! But maybe you should wait until they are a bit older. If the great outdoors don’t interest you, maybe try one of these following ideas. This special holiday also means that there will be fireworks! Spend a night in the local park watching the beautiful display of fireworks with your family. They will love watching the flaming balls of light stream high into the sky, only to explode into thousands of smaller flaming balls of light. After fireworks play with some sparklers until your kids are too tired to get excited about the sparking sticks. Who doesn’t love animals? Your kids will go crazy when they see all the different creatures all in one area. This is also a great way to teach your kids about the different animals, where they come from, how they live, what they eat, how they obtain their food, and any other interesting facts that you can read off of the informational signs. You may even learn something new too! Here is a fun fact for you: A polar bear’s skin is actually black. Already knew that? Alright how about this one: Gorillas can catch human colds and other illnesses. Or this one: A cow can sleep standing up, but can only dream while lying down. Animals are weird and your kids will love these interesting and random facts! While walking around the zoo with your children, pull up random facts on your phone and give your kids something to share with their class after summer ends! Not only can you learn about animals, but the zoo can take up an entire day of running from exhibit to exhibit. Your children will want to see as many different animals as possible, from the big cats to the nocturnal creatures and definitely the monkeys. Don’t leave without seeing the monkeys. By the time you leave the zoo your kiddo’s brain will be full of new information and they will be wiped out, enjoy your peaceful drive home and the rest of your night! What is another fun place to take your children that involves animals and fun? The farm! Visit your local farm to show your kids the animals that aren’t as wild. Children can pet many farm animals and your kids will love being able to make contact with creates besides your family dog. While you want you kids to get outside and enjoy beautiful summer days, sometimes an indoor adventure can be just as good. Find an indoor playground that will allow your children to play for hours and hours and never get bored. These indoor places of fun could include indoor trampoline parks, inflatable play places, arcades, and so many others. These are the perfect places to take the kids on a rainy or extremely hot day when you want them to still do something active but outside adventures are out of the question. Have your kid jumping, playing, and making new friends, while you sit back and relax! You can even join in on the fun at some of these indoor playgrounds. A museum is another great place to take kids during the summer. These are places that make learning fun and your kids will find something that will surely interest them. Space, dinosaur, history, and science museums are designed to make learning fun and easy for kids! There are so many different museums that it will be easy to try and find something that interest your kids. Maybe you could even make it a summer mission to hit every museum in the area and have your child tell you which was their favorite and what the most interesting thing they learn at each was! 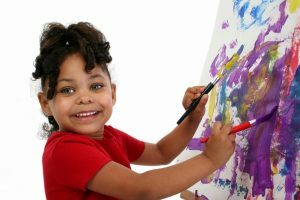 If your child loves arts and crafts, take them somewhere that will allow them to express their passion. There are place perfect for children, where they can paint a mug or plate which they can keep forever. This is a fun thing to do with your kids that allows them to keep a special memory! There are tons of different places to go and activities to take part in with your kids throughout the summer. Even the library can become something fun for you all to do! You just have to keep an open mind and try to think of thing your kids would enjoy, even if you may not be too thrilled about it. While it is fun and probably means something to your kids, staying home every summer to spend time with them is not realistic and can be draining. A nanny could help take your kids on special adventures throughout the summer, but if you want you kids to get an educational experience full of fun, learning, and great summer activities, keep Inch By Inch Child Care in mind. Our summer camps are full of events that have your children learning and keep them busy! Contact us today to learn more!